Motorcycles are a very basic form of motorized transportation. The engine, transmission, wheels, brakes, etc. are all hanging out there (at least in the case of vintage and classic machines) for us to see. 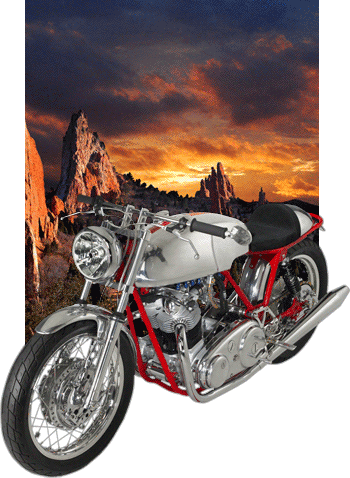 In recent times, this classic form of motorcycle has even taken a turn toward an art form. The Norton Commando is one of the most beautiful examples of this form with its raked forward engine and the sweep of the exhaust system. At Colorado Norton Works, we strive to maintain the classic Commando form and to deliver it in a clean fresh new package. We apply our own touches to the wheels, brakes, fenders, saddle, and paint scheme to create a Commando that is not only a fresh new look but one that still respects its vintage heritage.